Whether your child suffers from a peanut allergy or attends a peanut free school, finding alternatives for school lunches that contain no peanut products can, at first blush, be a challenge. With a bit of forethought, however, you will find that skipping the peanuts is easier than you may have initially thought. 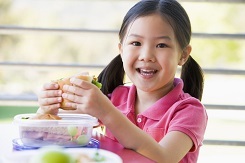 These ten ideas will help you to consistently pack a safe, allergy-conscious lunch for your little one. Personal Pizza – Slather a bagel or English muffin with pizza sauce, sprinkle with cheese and add your child’s favorite toppings before packaging it for a peanut-free lunch that’s sure to be a hit. If you want to simulate pre-packaged mini pizzas, put the toppings and sauces in separate containers so kids can assemble their own lunch. Pita Pockets – Sandwiches are a classic brown bag lunch fixture, but they can also be a bit boring. Instead of sending a sandwich, why not stuff a pita pocket with your child’s favorite peanut-free fixings? She’ll love the novelty of a self-contained meal, and the pocket can cut down on dribbles, spills and accidents. Sunbutter and Jelly Sandwiches – Some peanut-free schools don’t allow kids to bring anything resembling peanut butter in, so it’s wise to make sure that sunbutter and soy nut butter are allowed before packing a lunch containing these peanut butter alternatives. If it’s allowed, however, these delicious substitutes are sure to be a hit. Deli Wrap Pinwheels – Assemble a sandwich wrap made in a peanut-free facility with meats and cheeses that your child loves, then slice the whole thing into fun, finger food spirals. The smaller the portions are, the more easily kids can gauge when they’re full and the more fun they are to eat. Pasta Salads – There’s an endless combination of dressings, veggies and add-ins for pasta salads, just be sure that everything is manufactured in a peanut-free facility before assembling your child’s lunch. Beware that premade pasta salads, especially those with Asian flavors, may contain peanuts or peanut oil, so check the label carefully. Traditional Bento Box – Rice, protein and fresh produce are the staples of a Japanese bento lunch, so it’s easy to omit peanuts from the mix. Not all bento lunches are the ornate, time-consuming affair that cute-food bloggers espouse, either. Don’t allow these elaborate offerings to scare you away, because there are quick and easy bento recipes out there. Quesadillas – Tortillas made in a peanut-free facility and grilled with cheese, beans and meat are just as good when they’re cold, and they don’t contain peanut products that could potentially spur a reaction in allergic kids. DIY Mini Lunches – Those prepackaged lunch kits with crackers, cheese slices and deli meats are expensive, full of chemical additives and often contain a dessert of candy or baked goods manufactured in facilities that process peanuts. Pack your own version to not only save money and include healthier fare, but also to eliminate the possibility of peanut contaminated ingredients. Kabobs – Whether you opt for fruits, veggies or a deconstructed sandwich made of bread cubes, deli meat pinwheels and cheese cubes, kabobs are a fun way for older kids to enjoy a wholesome, peanut-free lunch. As with all processed foods, just be sure that the bread is baked in a peanut-free manufacturing facility. Given the sensitivity of schools towards anything that can be used as a weapon, be sure to check with your child’s teacher before serving lunch on a stick. Popcorn – Potato chips are full of grease and empty calories, but the air-popped popcorn that you make at home is sure to be free of peanuts if the label contains no warnings regarding shared manufacturing facilities. Include this healthy, fun snack as a side. If your child does not suffer from a peanut allergy but attends a peanut-free school, it can be tempting to “cheat” every once in a while. It’s imperative to understand that peanut allergies are potentially lethal for the kids who suffer from them, and that even skin contact with a peanut-contaminated surface can have serious repercussions. Your child’s allergic classmate deserves to attend school without fear of contact with a substance to which he is deathly allergic, so adhere to peanut-free guidelines and save the PB&J for an after-school snack.